With its perfect Montana charm, we fell in love with our Big Sky home the first time we saw Blue Grouse 2 in photos. The swirl of enchanting emotion continued to escalate on the day we first visited during the summer of 2016. With its comfortable furnishings, cozy nooks, and spacious floorplan, Blue Grouse 2 immediately became our home away from home, offering the perfect retreat for multi-generational families or friends enjoying traveling together. Its location embraces the perfect combination of seclusion, extensive views, and wildlife watching within close proximity to the activities, shopping, and dining in the Meadow Village area. And the brief, beautiful drive up the mountain to skiing and snowboarding in the winter, and mountain biking, zip lining, and hiking in the summer, is breathtaking. With easy access to Yellowstone National Park, Bozeman, and beyond, we feel weve found our perfect piece of western paradise. Our hope is to share this beautiful Montana property with as many visitors as possible so they, too, can receive Mother Natures blessings and refreshment fulfilled by this wonderful cabin retreat. As John Muir once said, Going to the mountains is going home. Blackstone Property Management is very knowledgeable, cares about the guest experience, and is professional. We HIGHLY recommend this company and the staff is outstanding! Ski-in/ Ski-out..YES! We had a wonderful time and will be coming back again! An incredible experience in Big Sky Montana, HIGHLY recommend. 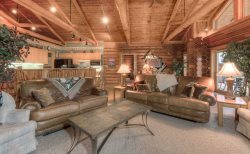 This property was very spacious and beautifully decorated and located close to all that we needed to enjoy skiing and dining. We were initially greeted by the local property manager from Blackstone Property Management, Travel Big Sky Vacation Rentals and Yolanda was a delight and was extremely helpful in showing us around and answering our questions, very knowledgeable. We were able to leave our skis in the heated garage and our boots, gloves on boot warmers in the mud room with all of our gear. In the morning we could just click into our skis and ski out on a groomed ski access run to the White Otter and Cascade lifts area. One of our family members choose to drive to the Moonlight Basin area, park the vehicle and was there in less than 2 minutes from the house with skis in tow and on a lift shortly there after, very convenient and would highly recommend. The kitchen was spacious and the property was perfect for our first time to Big Sky Montana. We will be back and we will be contacting this vacation rental management company again. They made us feel right at home and the knowledge and infectious smile was very welcoming and professional. Thank you Blackstone! Outstanding! ***** Property lived up to expectations, walking distance to Big Sky was a huge plus! Management company was great, thank you. We enjoyed our stay. Worked with Yolanda, excellent communicator. Everything taken care of and explained well. Thank you so much. We would defiantly come back to Big Sky and rent again from Blackstone Agency. Having never been to Montana or Wyoming and bringing eight family members together was a bit daunting. Yet having our accommodations be so perfect for us, it made the vacation excellent in every way. The house was big enough where we never felt cramped. Having the hot tub and pool table was a fun addition for us. Everyday was perfect weather so we were not home much, but when we were, we felt " at home". Beds were super comfortable and the bathrooms were excellent. Even finding bug spray to use was a good surprise. Love the front porch with all the outside furniture, we had breakfast coffee in the morning outside and sat on the porch at night to see the stars and the moon, totally awesome. So nice and close to the grocery store and other amenities. Can't say enough about this trip. Pleasing 4 adults and 4 kids (2 teenagers) isn't easy' but this trip pleased us all. All in all, we ALL loved it. Thank you, thank you! Ken K...Blackstone Management was very helpful and courteous to address any concern. Yolanda and Mark were exceptional.